Please provide info on the curtains and/or where to find the fabric! I have a porch with 11 Windows 32" and a picture window, 1 outside door and 1 French door to living room. I currently have cellular shades, up and down pull. I was wondering if I could put curtains over the shades. can you provide the name of the fabric used in the curtains? Please let me know where I can purchase the curtains. Thank you. These are fiddle leaf figs. Where is the drape fabric from? - These drapes are lovely. Where can I find the Ikat design? 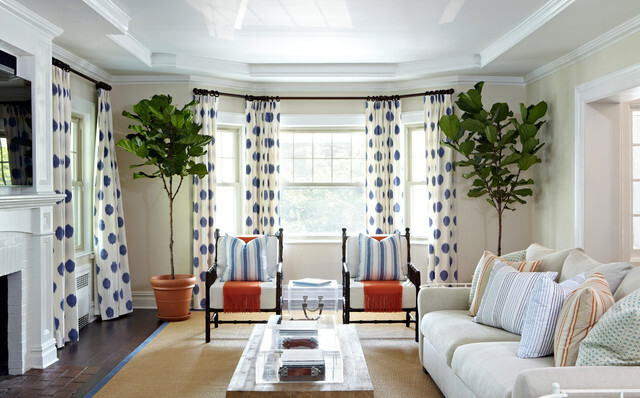 Where can I find fabric - Or window treatments? Where can I find the curtain rods? Where can these curtains be found? Question - Where are the curtains from? Project: Installing window treatmentsWhy: Taking your window coverings from something that merely suffices to something that makes a statement will help your space look its best. Imagine the living room shown here without the patterned drapes and it’s easy to see why window treatments can act as the icing on the cake. But they’re not just decorative. As mentioned earlier, window treatments are an opportunity to better control privacy and light, hide awkward features and provide better insulation. Foolproof Plan 1: Dots and StripesMix a few different sizes of stripes, and maybe a polka dot too, and you’ve got a hard-to-go-wrong scheme with plenty of personality and energy.